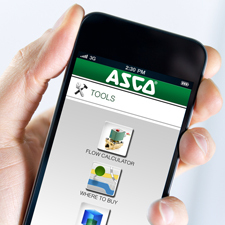 ASCO Numatics, the world's leading manufacturer of comprehensive fluid automation, flow control, and pneumatics solutions, has introduced a mobile app for iPhone and Android Devices. By searching "ASCO Flow Calculator" within either the Apple iTunes or Google Play store, the user is able to download the mobile app at no charge. This app features the ASCO Flow Calculator, which enables users to quickly calculate flow for a valve or determine the Cv needed to properly size a valve. Additionally, the Fluid Guide provides reference information on the types of valves available for most common corrosive and non-corrosive gases and liquids. Other features of this app include a Where to Buy Distributor locator, which can be filtered by zip code or by GPS location (when Location Services are enabled on a mobile device), as well as a Conversion tool to convert between metric and imperial values. This conversion tool includes nine conversion calculators for Area, Energy, Flow, Length, Pressure, Temperature, Velocity, Volume and Weight.